If you love baking with almond flour, but don’t love how expensive it is at the grocery store, try making it at home! It’s cheaper than store-bought options, and is ready in just minutes when you use a food processor or blender. Can You Substitute Almond Flour for All-Purpose Flour? 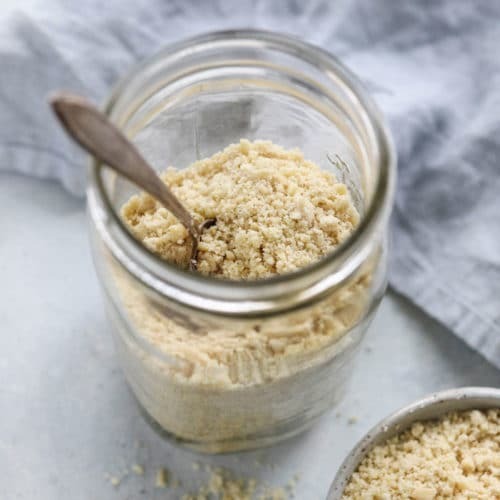 One of the most common questions I am asked is how you would substitute almond flour for all-purpose flour, to make a recipe healthier or naturally gluten-free. If a recipe calls for eggs, I’ve found that you can usually swap almond flour for all-purpose flour using a 1:1 ratio, which makes it an ideal alternative. However, I recommend testing this with a recipe before serving it to company. Because almond flour is higher in fat and protein than all-purpose flour, it’s not the best substitute when making a loaf of bread or anything cake-like that does NOT call for eggs. Instead, I recommend looking for almond flour recipes that have already been tested, so you won’t have to do the guesswork and potentially waste ingredients. How Healthy is Almond Flour? Compared to white all-purpose flour, almond flour is high in protein and monounsaturated fats to help leave you feeling satisfied. Just one ounce of almonds has 6 grams of protein and 3.5 grams of fiber! Because almond flour is simply ground almonds, which are a good source of magnesium, it may also help with blood sugar control and lowering blood pressure levels. Is Almond Flour Considered Low-Carb? I think almond flour is a great choice for low-carb baking. 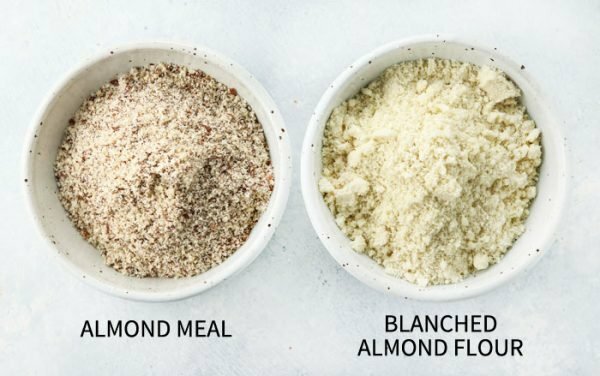 A 1/4 cup of blanched almond flour has 6 grams of carbohydrates and 3 grams of fiber, so it has 3 grams of net carbs. For comparison, a 1/4 cup of all-purpose flour has nearly 24 grams of carbohydrates and less than 1 gram of fiber. Is Almond Flour Good for Keto? If you’re following a keto diet and need a flour alternative, I think almond flour is a good option since it has only 3 grams of net carbs. On a Keto diet I wouldn’t imagine that you’d want to make too many sweet baked goods, but you can make low-carb almond flour pancakes without maple syrup to get a bread-like fix! What is the Lowest Carb Flour? As you can see, almond flour is the lowest carb flour, followed closely by coconut flour. Keep in mind however, that you can not substitute almond flour for coconut flour. Instead, look for coconut flour recipes that have been specifically developed to use that high-fiber flour. Is Homemade Almond Flour Cheaper Than Store-Bought? How does the cost of making homemade flour compare to buying it at the store? It used to be more of a drastic difference (close to a savings of $3 per pound), but I’m updating this post to reflect current 2019 prices. 8 oz. blanched slivered almonds from Trader Joe’s currently costs $3.49. That comes to about $0.44 per ounce. 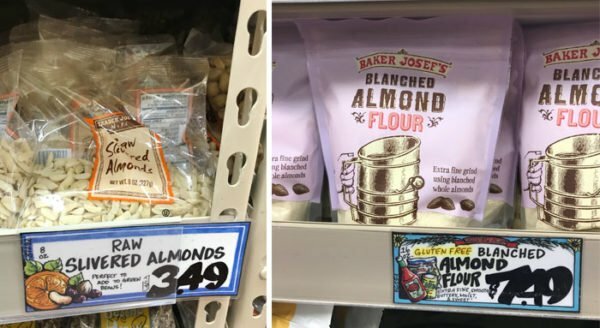 One pound of blanched almond flour from Trader Joe’s currently costs $7.49, which comes to abouve $0.47 per ounce. 3 pounds of Honeyville Blanched Almond Flour (from Amazon with free shipping) currently costs $23.35. That comes to $0.47 per ounce. So, when you make your own almond flour you save roughly $0.50 per pound. 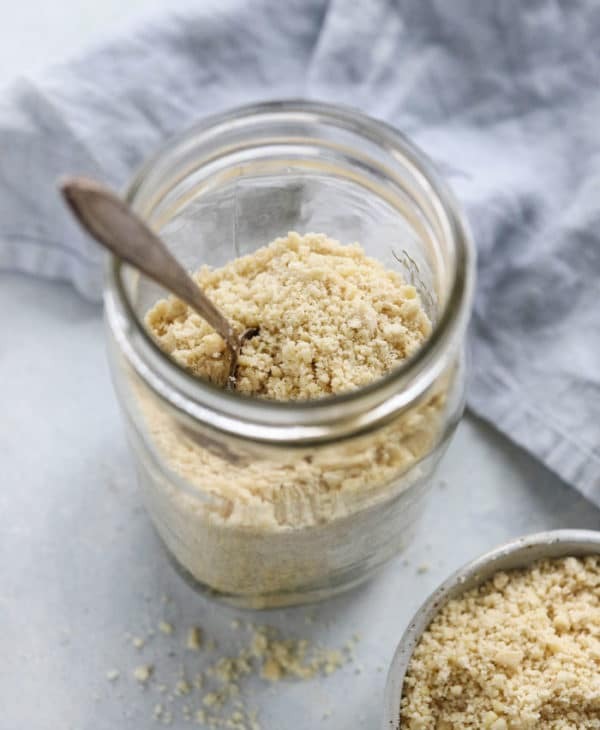 This cost savings might not be motivation enough for you to make your own almond flour at home, but there’s still an advantage to those who can’t find prepared almond flour in their area. It’s also nice to make your own almond flour if you don’t need that much of it for a recipe. If you only need a 1/2 cup of almond flour, you can easily grind your own without worrying about storing the rest of a big bag for months. When a recipe calls for almond flour, it’s most likely referring to blanched almond flour, which is made from almonds that have had their skin removed. Blanched almond flour is great for making authentic-looking baked goods with no brown flecks in the batter. Ground whole almonds are referred to as “almond meal” and can be used interchangeably in most almond flour recipes. However, keep in mind that the texture and appearance will be slightly different if you make this swap. Almond meal tends to make baked goods more cake-like in texture, so cookies won’t be as crisp or buttery with this alternative. One cup of slivered almonds = about one cup of almond flour. One 8 oz. bag of these raw blanched slivered almonds turned into exactly 2 cups of almond flour–> just what you need for my almond flour cookie recipe! Only proess one cup of almonds at a time. Blending more than that creates an uneven texture, so you’ll wind up with clumps of un-ground almonds. If you don’t mind seeing specks of brown in your resulting baked goods, you can also use regular whole almonds (non-blanched) to make almond meal. Almond meal makes “cakier” baked goods, rather than giving baked goods a buttery, shortbread-texture the way almond flour does. I find that I get the best, most finely-ground results using my Vitamix blender, but a food processor can definitely be used if that’s all you have. The resulting baked goods will just be slightly grainier that way. 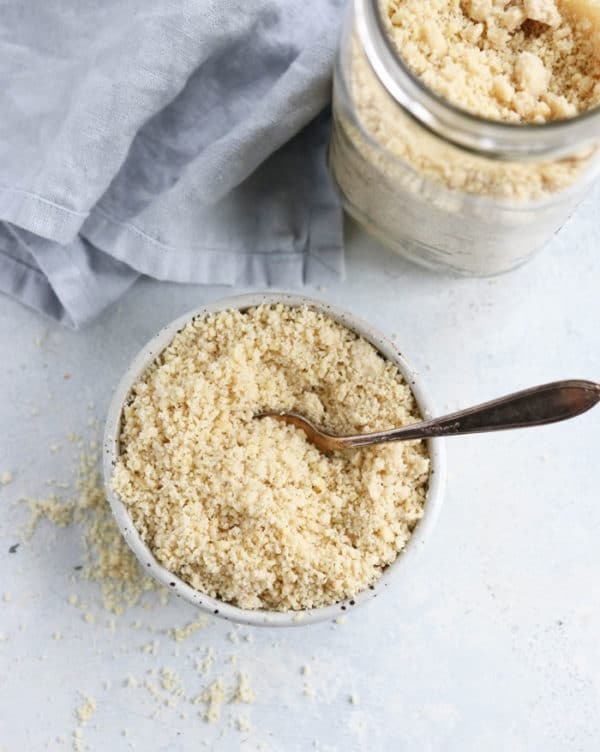 Here's how to make ALMOND FLOUR at home in just minutes! It's a great gluten-free and grain-free option used in low-carb baking. I love that it's high in protein and monosaturated fats. Place the blanched almonds in a high-speed blender or food processor, and process until they are finely ground. If using a high-speed blender, be sure not to over-process as the almonds will eventually start to release their oils and become almond butter. For best results, do not blend more than 8 ounces of almonds at a time. (I tried using 16 ounces and couldn't get them evenly ground.) For the most finely-ground results, I've found a blender works best, but the flour I made in the food processor also works for making almond flour recipes-- the final product is just slightly grainier. Store leftover almond flour in an airtight container in a dark pantry, or better yet in the fridge or freezer for the longest shelf life. Almond flour can keep well for up to one year if it's not exposed to heat or moisture. I hope this helps you all create even more almond-flour-based goodies in the future! Reader Feedback: Have you tried making your own flours before? Let me know your favorite way to use almond flour in the comments below! I use whole almonds to make my almond flour. I soak them overnight, dehydrate them, use the food processor initially and then to my Blentec to finish it off to a nice flour. I store in the freezer so there is no chance of it becoming rancid. Nuts.com is a great place to purchase quality products. I found blanched, slivered almonds at Winco (a big grocery store with lots of bulk bins) for $3.65 for a whole POUND!that’s about 1/2 the price of TJs per pound. Anyone now the best blade to use for making almond flour in a food processor? I don’t have a Vita Mix. Thank you soooo much for this. I live on the island of Crete. While Cretans have some stuff that is different there is no way they have almond flour. I can now make my own. Looking forward as we are LCHF now for almost two years and I have been looking for a flour substitute as long as that!!!! HOORAH!!!!! Happily I recently found you Megan 🙂 I can no longer have wheat and we have enjoyed a lot of your recipes. Since we don’t eat meat or fish etc either we rely a lot on nuts but with all the posts above I was concerned since it seems we can no longer get anything without it being laden with pesticides. I wrote to Paramount Farms who supplies costco with a lot of there nuts pistachios almonds … asked them if they used phosmet on their Wonderful pistachios 2 days ago have not heard back and if I had to guess probably will not. I read above that ALL costco’s nuts have PPO used on them does that include walnuts? Will buy TJ’s organic almonds after this thanks for the info on that. I attempt to buy organic most of the time but it is cost prohibitive with all the cooking that I do. FYI, you can’t accidentally make a nut butter. It takes at least a good 25 minutes in a food processor to turn any nut into butter, and that’s the bare minimum. The process is faster if you roast the nuts first, and it can also depend on the power of the food processor or blender you’re using, but you’re not going to make a nut butter without deliberately trying, so just a minute or three of grinding any nut…it isn’t going to turn into butter that fast, so no need to stress that detail. You can accidentally make almond butter if you grind your flour in a Vitamix– mine makes most nut butters in just about 1 minute! But, yes, in a food processor it would be nearly impossible. Hi, I used a coffee grinder to make blanched almond flour using Trader Joe’s blanched almonds. Works great! I made chocolate chip cookies (based on your recipes) using about 1 cup of almond pulp, with a cup of homemade almond flour and about a half cup of TJs almond meal. Turned out really well, and healthy chocolate chip cookies. I will also try making the cookies without the almond pulp, but I had some and I decided to see how they would turn out. P.S. I’ve also seen info about blanching almonds at home. It’s quick and you just pop off the skin (apparently where most of the “anti-nutrients” are), and you could dry them and try to make blanched almond flour this way…? I just bought 3 lbs of almonds at Costco for 12.69. If my math is correct that’s 26 cents per ounce. Better than Trader Joe’s price. Best of luck to everyone who is trying to live a better lifestyle. I love web sites like this. Thank you Megan. I’ve made “regular” (by blanching, removing the skins, and grinding), and “post-almond milk,” but I’ve never had enough of either type to make large enough recipes to compare the quality / characteristics. The “flour” made from almond pulp is very different from store-bought almond flour, thanks to the oil that is removed in the milk-making process. I have found I need to compensate by adding more fat to the mix in any baked goods that I try to use it in! Thanks for your reply, Megan! I also found the almond pulp flour to be drier. I’ve found no recipes on-line that call for this type of flour, which would, as you mentioned, require additional fat (yum!). BTW, I found a review of the two most popular commercial brands, comparing their texture. Interesting! http://www.gluten-free-around-the-world.com/blanched-almond-flour.html . It appears that the difference between the two is the “grind” and NOT that one of them was de-fatted. Why not go all the way and blanch your own almonds. Here’s how: put 1 cup almonds in a 2 cup Pyrex measuring cup and fill with water (filtered) till it covers the almonds. Place in microwave for 2 minutes. The skins slip right off when cooled enough to touch! I’ve been doing this for years saving lots of $$! Love the ideas here! I have a Vitamix and was going to try this recipe. How high did you have your Vitamix to grind the nuts for 20 seconds? Thanks! I usually keep mine on low– too high, and it will become nut butter quickly! I use the tamper to help move them around, too. Megan, thank you for posting both options (and the link to the cookies) :-D. I’m going to make cookies for my Daddy, who has celiac disease. I have several types of gluten-free flour but no almond flour :/. I do, however, have about 4lbs of almonds! Yay!! Enjoyed all comments re. Almond flour. I am interested in whether the flour with the almond skins make it more nutritious or not. Comments.??? I’m loving the great insight of info here! I wanted to point out that Costco has the Blendtec Blender in our stores for $320 right now, and regularly, if purchased online or in department stores, it’s nearly $500. I LOVE it and cannot recommend it enough, if you can save a bit for it and get it. LOVE costco as they warranty things great and returns are a breeze, if need be. The unit they have at Costco also comes with the “Wildside” (larger) blender jar, to accommodate the bigger recipes from making soups, breads, ice-creams and so much more! =) I just got mine about last week (early Oct.) and they were getting down to about 20-ish there, so hurry, if you can! Luvz! I too have the Blendtec and love it. Fits under the counter and doesn’t need a plunger. Two plusses over the Vitamix in my book and slightly less expensive. Going to try almond flour. Thanks for the tips on this site. What a great conversation! thanks to everyone for all the info. I have been ordering almonds from Briden Wilson farms in 10 pound bags, so i know they are raw and untreated. Love them! They taste better than any other almonds i’ve tried. I’m cooking for a family of five so we go through them quickly enough. I’ve never made almond flour though, going to try this week. As far as blenders go, I’ve been cooking for twenty years with cheaper blenders. I finally saved up and bought a blend-tec. And I so wish I bought one years ago. It is an absolute worthwhile investment. I don’t even strain my almond milk anymore. My blender suggestion is to stick with $30 blenders or go for the blend-tec or vitamix. Everything in between just isn’t worth it. I make my own almond milk to have in tea (the only milk aside from the more expensive cashew milk to give me a satisfying result with my regular beverage of choice) and I use the resulting almond lees to make almond flour with. I dehydrate the almond mass left over from processing the milk in the slow oven (drying oven) of my wood burning stove until it is well dried and crush the malty mix up to use as almond flour. Its light, fluffy and very flour like and fantastic for using for baking. The maltiness comes from soaking the raw almonds overnight before making the milk and its a very tasty flavour in baked goods. do you soak the almonds before grinding? if so, how do you dry them out? Hi, I make almond milk and wondered if I could use the pulp once dydrated in the oven again and blitzed, how long this would last for? If the almond pulp is thoroughly dried in the oven, I would imagine it could last a while (maybe up to a month?). The more moisture you remove, the longer it will last at room temperature. Of course, I always err on the side of caution, and prefer to store things in my fridge for longer shelf life! The issue raised has several parts. Why not to buy flour? 1) All commercial flours are made in large machines which require maintenance and lubrication: since a bit of detergent residue and lubricating oil are allowed (by the U.S. Government) to be mixed into the food without anyone getting in trouble OR telling us, you can be assured that pre-packaged has most in it than the basic ingredient. 2) Granaries attract bugs and rodents which leave droppings of which a small amount is allowed in commercial grains and products. 3) Raw seeds and nuts have a germ along with fat, protein, and carbs. Once these are ground (whether roasted first or not) the germ and fat begin to spoil. This is how Betty Crocker (General Mills) made fortunes by selling white flour that is simply starch with the spoilable items removed (and Kellogg and Post made fortunes by doing the same thing with their “corn flakes”). 4) We consumers have no way of knowing how old grain is or how long ago it was ground into flour: it could be years old, like some peanut butter in stores. Manufacturers have ways of concealing rancidity so we do not notice it. 5) We cannot control what goes into commercial flour. Did you know that commercial “whole wheat” flour only needs to be 51% whole wheat flour and the rest can be white flour? Cheaper ingredients are allowed in all flours in small amounts (but that isn’t what we think we are buying is it?). There are other reasons too, but freshness and product control are the main reasons for grinding you own. I hope you continue on this path to a long healthy life. Welcome to the journey. The thing about the Vitamix besides its awesome power is that blade. it is NOT sharp. Therefore it crushes and mashes its contents rather than cutting and dicing them. I bought a cheap cuisinart portable last year and noticed in cleaning it that its blade can be used 1) sharp side or (repositioned upside down on its stem) 2) mashing side. Since it needs its plastic jar to operate (interlock), I haven’t wanted to use it, but I believe you could. Mine is the cheapest model, the “”Smart Stick with blender grinder attachment” It cost about $40 on sale at Macys. And “Thanks Angela” for starting this post. Megan, I’m also replying to Angela up in #1 position. I appreciated your answer to her noting the conditions in flour mills, even the best of them. I would really like to try this, but I am currently lacking a blender. I like the Hamilton Beach Wave Maker Blender…Model 56221> It costs around $70 but is totally worth it. We’ve had one for three years at least and have made green smoothies with it almost daily and it is still going strong. Also great for making almond milk. I wouldn’t try to make almond meal in a blender as they are too narrow and would be hard on the blender. If you also have a food processor and did it a bit in the food processor and then a bit in the blender it might work…but a bit is all you need to do as otherwise it will turn to butter. I have a KitchenAid blender that I paid $100 for at Target. I couldn’t afford a good one at the time either. It had twice the power of the Oster blenders and has worked really well for the 2 years I have had it. I also bought the food processor and I don’t recommend it. The blender works much better for all my needs. You can make the following types of flours at home. Using a Vita-Mix is the easiest way, but a food processor, blender or even a coffee grinder (if you don’t need to much) will work. I recommend Ammin Nut Company, http://www.amminnut.com/ They’re a small family-run place in California. I just got a Vitamix, so I can’t wait to try making my own almond flour! I’ll pick up some blanched, silvered almonds at TJs. By the way, for those of you on the fence, if you call Vitamix directly, they can do a 3-payment plan for you. I got a great deal on a refurbished machine that way. Google for a coupon code for free shipping too. It’s an older model, and therefore much cheaper than some of the newer versions– but I also find that it’s more durable! I’ve used the newer model, and actually prefer mine, so I’d buy this one again in a heartbeat. (And will, if mine ever breaks!) If you order it on Amazon, like I did, it comes with free shipping and a 5 year warranty, too! FYI – Costco has begun carrying this blender regularly in stock and the fancier new version when trade shows have been coming into town. It might be another way to get a discount on this expensive (but worth it) blender. Hi, Vitamix will sell you a “refurbished” mixer for about $100 cheaper; I purchased one through them about 3 years ago, and have been VERY pleased. They also give you the regular “new mixer” warranty, recipe book, etc. and were wonderful to work with over the phone. I’ve purchased the “dry” container since, and the almond flour comes out beautifully fine and fluffy. Hi Cheryl, You might also check out QVC for a Vitamix. They have featured one as their today’s special value in January for the last two years. I got my new one for $399 with free shipping. It has a 64 oz container, is variable speed, has a 5 year warranty and came with a cookbook plus a drinks book. I have a 20 year old Vitamix that still works fine, but the new one was such a good buy that I couldn’t pass it up. QVC has Vitamixers on their website regularly too. Hi Megan I am confused? When I grind down whole almonds it makes my almond butter. Do I need to grind it longer to make flour? Hi Suzanne! When you grind whole almonds into almond butter, they actually go through the “almond flour stage” quickly at the beginning of that process. 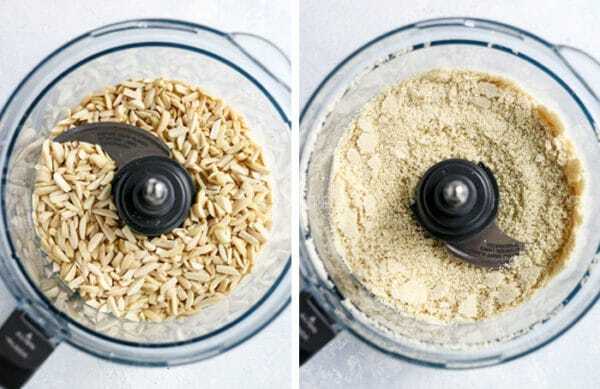 It only takes 30-60 seconds in a blender (depending on the power) to create almond flour, while it usually takes more than a few minutes to grind them down into butter. Yes, organic is always ideal, but I’ve found it very challenging to find blanched organic almonds. So, that seems to be the compromise if you want perfect-looking cookies. I’ve actually started grinding my own almond meal for baking, since Trader Joe’s does offer organic whole almonds now, so that’s always a good option, too! I just found a local farm that sells organic raw almonds. Haven’t order them yet, literally just found them. Site is organicalmondsraw.com I will let you know how they look when I received them. Made lots of almond milk today, and meal is in the oven right now, getting ready to attempt almond flour. Did I read somewhere that you can freeze almond milk? I made too much. Thank you for such a great and insightful website. Love reading it all. price and delivers to next town. Read on one website about the almond pasteurization that is required. Yes, almond pasteurization is required on all almonds in the USA, unless you can find a source directly from a local farmer. Many raw food websites offer imported Italian almonds, though, which are supposed to be truly raw. I’ve also seen the Italian raw almonds popping up at Whole Foods lately! Hi! I’m so glad I found this! I have been using Bob’s Red Mill almond flour/meal, not knowing that everybody seems to hate it. I just bought a Vitamix last week, so as soon as Trader Joe’s opens I’m heading out to buy some blanched almonds so I can make my own almond flour! Hopefully it turns out much better than Bob’s Red Mill. I’ve really started looking forward to your posts. Love the grain-free desserts. Keep em comin! I actually make my own almond flour by making almond milk, dehydrating the pulp, then grinding the pulp down into a flour in the VM. Then you get two uses out of 1! Thanks for the video! I’ve actually never been to Long Beach, but I usually recommend avoiding all the tourist-y areas if you plan on visiting LA. I like to take visitors to Griffith Park or the Hollywood sign for a hike, instead! Perfect! I also love using almond flour, but hold out on purchasing it because of the price. I too thought, “oh I just won’t bake as much.” Yeah right! Thanks for sharing this on the blog. Have a great weekend! Hope you ladies enjoy your weekend! Megan, I had a few (unused!) packages of Sheer Energy pantyhose. The legs are sturdy and they work great for straining almond milk or coconut milk. I have used unblanced almond meal in your shortbread cookies and they turned out good. Oh, good! Thanks for letting us know! I like to try to get organic when I can. Are almonds one of those foods that doesn’t matter if you don’t buy organic? Oh, I have been wanting to get a Vitamix for awhile and my poor Ninja just went out! 🙁 What model did you get? Any advice regarding pros and cons? I love almond flour!! I have made oat flour but that’s about it..have a great day! Not only is it significantly cheaper than the “newest” model, it also seems to be more durable. I’ve seen the newer models break rather quickly, while mine is still running strong! Of course, they’re all covered under a great warranty, but it’s nice that I haven’t had to use it! Hope you get one soon! It’s totally a life-changer. I too love my vitamix and will have to try this recipe thank you. Unfortunately I cracked mine yesterday when grinding dried cheese rinds. Thanks for mentioning the warranty. Will look into that. Luckily I bought it at Bed bath and beyond with a 20% off coupon and their exchange policy is awesome. Your recipes are really fantastic. I hope it ok if I share a contest with you that I entered. When you used your Vitamix did you use the dry blade attachment or the regular blade? We have a Vitamix but don’t have the dry blade. That Vitamix doesn’t have the variable speeds, which is CRITICAL to getting the most out of your Vitamix! If you are going to spend money to get one, which I recommend, and I absolutely love mine, get one that has the variable speeds so you can make anything and everything! I got a refurbished one, which has a 5 year warranty. Go to Blenderlady.com and check out her info! (This isn’t me, it’s just a great source of info and knowledge about Vitamixes) — I’m not getting anything by recommending the site, just passing along what I have learned. Good luck! When looking for a new Vitamix, I would DEFINITELY get the model with the container that is shorter and wider. 2 reasons: 1. Much easier to clean and 2. Fits better under upper cabinets. Other than that, LOVE my Vitamix! Heather, http://www.nuts.com sells gluten-free raw almonds. I can’t vouch for the safeness of them from a gluten perspective; I bought from them because I need food that’s not corn contaminated and they were mentioned as a possible resource for nuts and dried fruit. Wonderful post about making your own almond flour. I’ve done it for years and it works like a charm. I am VERY cautious with anything from Trader Joe’s. I mostly buy organic frozen fruit, avocados, or organic eggs there if I can’t get to my usual healthfood store. But that’s about all. They do not sell much legit healthy food – read ingredients before purchasing anything. I find very little at TJ’s that isn’t loaded with wheat/soy/salt/sugar/ingredients I can’t pronounce, or doesn’t have a high probability for cross-contamination. (I have a slight wheat allergy/gluten sensitivity which spawned my transition to Paleo eating. Never been happier/healthier). Just be leery about TJ’s food if you are concerned about something like Celiac. God bless! I have one question – Did you use the dry container for the Vitamix or the regular container to make the almond flour? I was going to ask that question which did you use the dry blade container as I don’t have that. So good to know!! Why don’t you use whole almonds? Why slivered? I would think whole raw almonds would be cheaper? I used the slivered almonds because they came blanched– and I was trying to mimic the popular Honeyville brand of blanched almond flour. When I’m only baking for my own family, we do use whole almonds, because we don’t mind seeing brown flecks of almond skin in our baked goods! I was told to use the dry. This is such a great idea!! My bag of almond flour expired I just realized, so I will definitely try this out and not buy such an expensive bag! Hello! Wonderful blog- I look forward to reading every day!I was also wondering what juicer you used; my birthday is coming up and I am going to treat myself to a juicer 🙂 but I’d love to have an idea of what to look for. Thanks!! My favorite juicer is this Breville model: http://amzn.to/IocAfY Unfortunately, that model is REALLY popular right now, and rather hard to find in stores and online. So glad you posed this, I had a question about almond flour. have you tried using the almond meal from Trader Joe’s in any of your recipes where this almond flour is used? Thoughts? I haven’t tried using the almond meal, but I have seen some SCD books that called for almond flour OR almond meal– so I assume they can be used interchangeably? Of course, that’s assuming that you’re not “baking to impress.” I have a feeling the almond meal would create a very grainy texture, which is why most recipes recommend using blanched almonds, so that you don’t have the texture from the skins. Let me know if you end up trying it! I have used the bag of Trader Joes almond meal ($3.99) in every recipe I have tried here and its all good. I first used a $10.99 bag from my local health food store of a pure white almond flour, with the first receipt I tried…the TJ almond meal must have the skins on or be unbleached as it almost has a “wheat” look to the flour/meal. I have found it to have much better flavor and for the price stock up and keep it in the frig to last longer…so its on hand when I’m in the mood to bake! Thumbs up for the TJ almond meal! I love TJ almond meal. I use it to bread anything I am going to fry. I haven’t tried baking with it. I used Trader Joe’s almond meal and I agree…it gives the cookies a great flavor, and I prefer it over almond flour. Plus, it has more fiber, therefore, healthier :). Thanks for the tip! Ahh this is perfect! The main reason I haven’t tried almond flour yet is because it’s expensive, but I could totally make this myself! I wonder if you could do the same with chickpeas and make chickpea flour… although it’s not really that expensive so it’d probably just be easier to buy it. Bookmarking this one for sure. Thanks Megan! Don’t give up on oatmeal! Bob’s red mill products has gluten- free organic oats. One of Trader Joe’s oatmeal that comes in a resealable pouch is specifically gluten-free, safe for celiacs. Also, as mentioned Bob’s Red Mill tries to be also. i hope you are still reading these comments. I left one for you, but I hit the wrong button and put is under #22 as a reply to “Beginner 28” by mistake. Please see it there. It might help you. I usually take the leftover almond pulp from making my almond milk (which is done in a blender). Dehydrate the pulp, and then run the dried pulp through my food processor to reduce clumps. Works well for me. @Angela @ Eat Spin Run Repeat I have been getting ready to do a flour post about all different types of flours that you can make at home, cost differences, health differences, etc. I LOVE Hummus and have tried making my own version of “Chickpea flour” before and loved it for my hummus recipe! I have found in my research and in my own trying things out that you can make your own chickpea flour and it honestly costs about the same amount as buying it. I like to grind my own though. It makes me feel like I am not getting any extra fillers or anything in my flour. I will be posting it in about two weeks under my “Food” tab. You can check it out if you would like to. Megan! Thank you for this post! It helped me in my research and confirmed a few things I was just pondering but hadn’t actually tried. I LOVE YOUR BLOG just for the record! I hope you don’t mind but in the post I mentioned to Angela about different flours, I hope to link to this post? I hope that’s okay?